Will Forcing Retailers to Donate Excess Food Work to Reduce Waste? There has been a lot of talk about the new law in France which will compel food retailers to donate unsold food rather than throw it out. Given our work in food waste, we’ve been asked a lot what our thoughts about it are. I’m scheduled for a 30 minute call in on radio this afternoon so thought I should pull my thoughts together and a blog post seems a reasonable approach to doing that. First of all – reducing the amount of food that goes to landfill is a good thing. We should be looking at more ways to do that. Secondly, talking about food waste is a good thing. Higher awareness means lower waste – and not just at retail. Many Canadian retailers already divert product to food banks – largely from distribution centres. So what could possibly go wrong? As always, the details will make all of the difference. Here are a couple of thoughts about implementation. Where is the line? Some product that gets thrown out is clearly still edible and could be re-purposed. I was speaking to a student who regularly “liberates” food from behind food retailers just the other day. They found 8 wheels of brie and many potatoes and beets just the other day at a single retailer. I don’t know why it was thrown out but it was clearly still edible and was used. There is, however, also a significant volume of inedible spoilage. Who decides whats good and what isn’t? What happens to the stuff that isn’t? Will we burden charitable organizations with increased disposal costs? This needs to be figured out. What is donatable? Fridge space is often an issue at food banks. What if they don’t want it? Some stuff simply doesn’t move well at a food bank. What if they don’t want it? Who pays? There is already some donation. We don’t have a good sense of how much edible food is thrown out – although we know there is some. If retailers have to pay to sort and ship it to charities (assuming they have the capacity or ship it to multiple locations) this needs to be figured out. The classic operations management newsvendor problem suggests that as disposal costs go up, optimal order quantity goes down. Availability may decrease. That may be a good thing. Diversion (to charitites, animal feed or others uses) is a secondary objective to not generating the waste in the first place (apologies for the suggestion that providing food to the less fortunate as waste). Grocery stores may be more inclined to run out than to have to manage the diversion of excess. That may be a very good thing but it doesn’t increase the food going to food insecure individuals. In principle this is a good idea. It remains to be seen whether it truly is in practice. I am amazed at some of the things we see thrown out. It is unbelievable the types of food we see in the garbage. As we learn more about food waste there will be things we can do to reduce it. We will never completely eliminate it but we can definitely make progress. I am a big proponent of reduction but today’s rant is about unavoidable waste – coffee – and more specifically about individual serving coffee pods. We can’t reduce it unless we drink less coffee and I won’t begrudge anyone their cup of coffee. I think though we can do better on making sure that all of those grounds don’t end up in landfill. 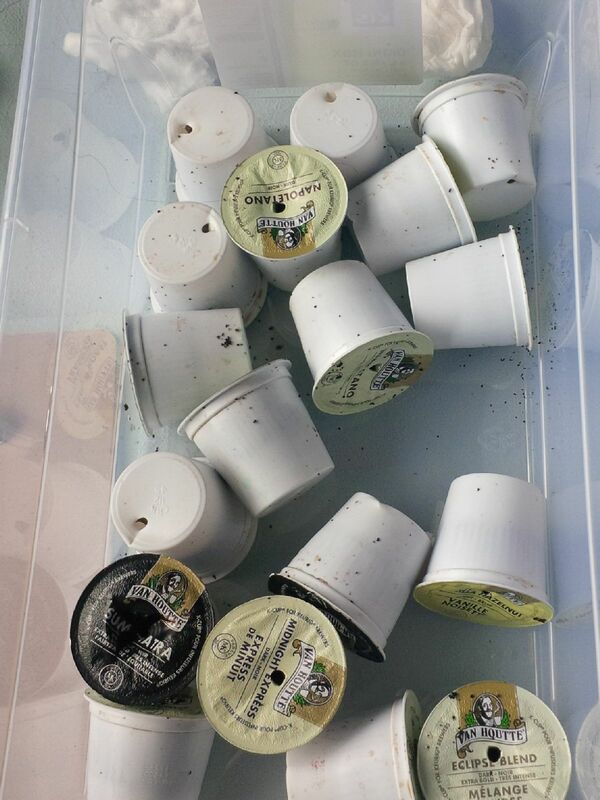 Coffee grounds are an unavoidable waste but these coffee pods end up in the garbage stream. Its egregious. The containers are recyclable and the grounds are compostable but together they end up in the garbage stream most of the time. Its got to stop. In out audits we looked at household organic waste production. We saw a huge volume of these coffee pods in the garbage. They are rarely separated. Is the convenience really worth the huge volume of garbage we’re generating? You’re not saving money. I hope the municipalities with waste bans enforce them on coffee pods. I wish we could charge a garbage tax on these sorts of products where they end up unnecessarily in the garbage. There are starting to be programs through which you can pay a premium and ship the pods back through a recycling system. That hardly seems sustainable with all that extra shipping. And are people who won’t separate the plastic from grounds are unlikely to pay extra, store them and then ship them back. This seems like green washing. This seems so simple. It drives me crazy. I won’t use them. Do you?